South-of-the-border sales of milk powder and cheese were off. In January, U.S. dairy export volume topped prior-year levels for the eighth straight month, paced by continued gains in sales of milk powder and whey products. Suppliers shipped 149,864 tons of milk powders, cheese, butterfat, whey and lactose during the month, 11 percent greater than a year ago. Overall export value was $412 million in January, up 10%. However, January trade data confirm a slowdown in exports to Mexico. Shipments south of the border were valued at $93 million, down 2% from last January, and the lowest figure since August 2015 (on a daily-average basis). Milk powder and cheese exports to Mexico were off. Overall exports to Japan and South America also trailed year-ago levels, while suppliers had more success in China (+47%), Canada (+23%) and Southeast Asia (+15%). 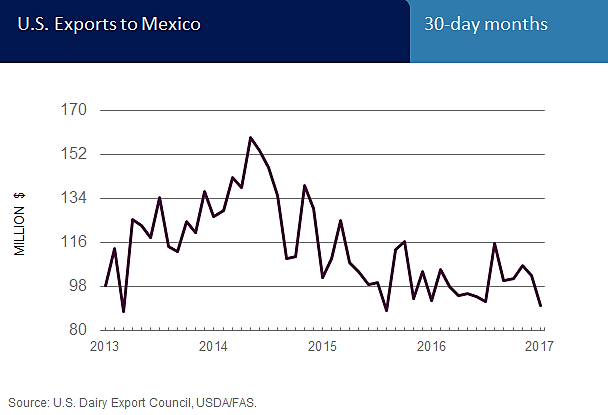 Official USDA data continue to show an increase in WMP exports to Mexico. But Mexican import data and trade sources don’t corroborate this, and we believe this volume represents SMP sales that were misclassified at the port. Therefore, we’ve adjusted NDM/SMP and WMP trade data for April 2016 to January 2017 to account for this misclassification. With this adjustment, exports of nonfat dry milk/skim milk powder (NDM/SMP) were 13% higher than a year ago, with material increases in sales to Southeast Asia (+45%) and Pakistan (+333%). Shipments to Mexico, on the other hand, slipped to 19,587 tons, down 2%, and the lowest figure since last March. Cheese exports totaled 22,670 tons in January, up 3% from the depressed levels of January 2016. Shipments to Mexico were just 5,435 tons, down 28% and the lowest volume since January 2013. Sales to Japan and the Middle East/North Africa (MENA) region also continue to lag. Meanwhile, Australia was the number-three customer in January, taking 2,186 tons (+63%), and over the last five months, U.S. cheese exports to South Korea were up 29%. Whey exports remain particularly strong. Total whey shipments of 41,220 tons in January were up 24% from last year. Nearly half the sales went to China, which bought almost twice as much as a year ago. Over the last eight months to January, U.S. whey exports to China were up 73%. However, in January, exporters sold less to Southeast Asia (-10%, the lowest volume since December 2015). U.S. exports of fluid milk and cream were up 12% in January, but shipments to Canada began to slow. Exporters sold 3.11 million liters to Canada in January, compared with an average of 6.91 million liters/month in the fourth quarter of 2016. Lactose exports were up 1% in January. Gains to Southeast Asia, China and Mexico offset declines in exports to New Zealand. Shipments of milk protein concentrate, butterfat and whole milk powder remain negligible.